If you are looking for a Pre Workout shake that will help power you up for the gym and make you feel like hitting the plates, wait no longer. 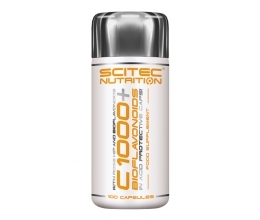 The nitric oxide (NO)activators, Creatine Monohydrate and stimulants in this formula will revitalize you while helping to make you seem more vascular and gain size. Shock Therapy™ can actually motivate you to get into the gym and hit the weights! Unlike many of the other pre-workout N.O. products on the market, we include an antioxidantcomplex that is essential when taking nitric oxide stimulating ingredients, due to their oxidative nature on human cells. Now you can have the "perpetual pump," the extreme workout you crave, and keep your body safe from the free radicals that are generated as a side effect of the nitric oxide activation process. Why should you choose Universal Nutrition's Shock Therapy™? It Works. If you want to get energized and motivated in the gym, Shock Therapy™ is for you. This formula will make for some very intense workouts that will help you put up more weight and will result in mass gains. Your body will feel jacked all day from the blood rushing to your muscle tissue transporting needed nutrients for real growth. We don't use any sugar so there is no worry about fat gains. We use the highest quality ingredients, from creatine all the way to our antioxidant blend. You won't find another product like Shock Therapy™; it is truly original amongst pre-workoutenergizers and cell volumizers. It has a healthier formula. Since Shock Therapy™ helps your body create more nitric oxide, you need an anti-oxidant complex to scavenge the hazardous free radicals that are released as a result of the nitric oxide process. Our competitors aren't keeping your health in mind; we are. It has a better formula. Shock Therapy™ uses R-ALA to help insert the creatine and nitric oxide stimulating components into circulation, whereas the competition either does not use any form of alpha lipoic acid or uses the standard ALA, which has been proven to be less effective than R-ALA. Many individuals do not like to ingest aspartame and favor sweeteners such as sucralose. Shock Therapy™ does not use any aspartame, while some of the other popular supplements do. 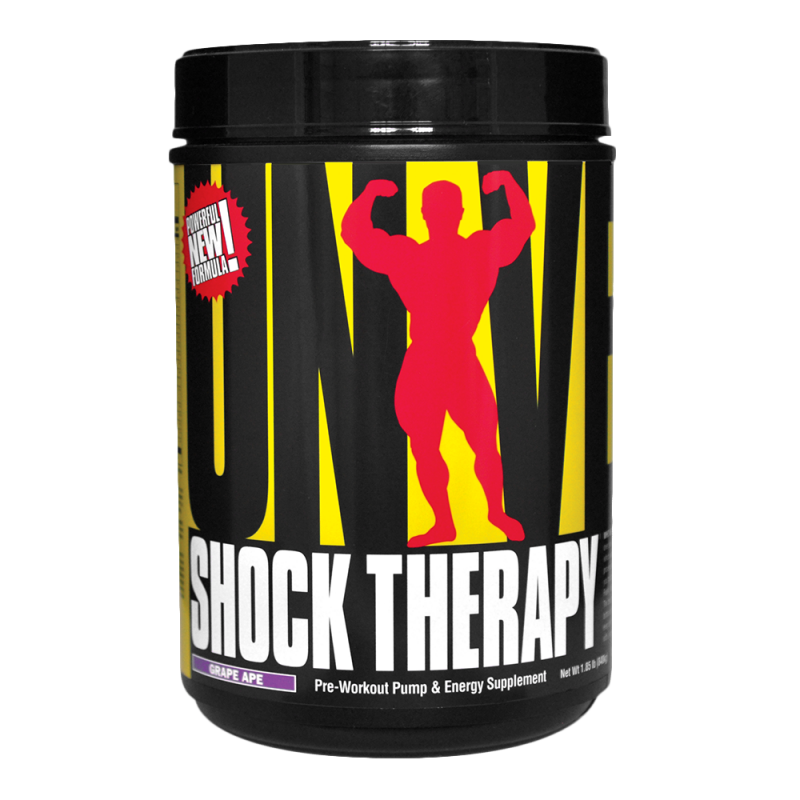 Shock Therapy™ from Universal Nutrition. 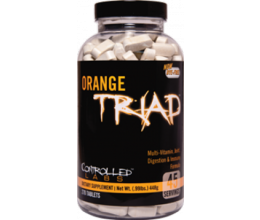 The one, comprehensive supplement that can change the way you train. Jam-packaged with energy factors, growth nutrients, antioxidants and nootropic "brain boosters", Shock Therapy™ can be your greatest ally in the war against training monotony and progress plateaus. With Shock Therapy™ you'll never go through the motions again. So much of the pursuit of bodybuilding is mental. Physical effort, genetic predisposition, hard earned muscle? Yes, these are all obvious factors necessary for success in the gym. But without that mental edge, without that pinpoint focus, and the ability to generate the intensity needed to take your physique to the next level, you'll go nowhere. Such is the plight of the bodybuilder. The bigger and more advanced you are, the more difficult it becomes to get it done, day in and day out. Over the years, you've tried every supplement that came down the pike. Energy products, cell volumizers--anything you could get your hands on that just might have given you that edge that you were looking for. And every time, you came away disappointed. You've eagerly sought something to reignite that fire… Something to get you through those tough days when you just didn't "have it." You want a product that will make you feel alive in the gym, in the zone… Something that will make you look forward to your training. You want increased strength, better pumps-you long for the fruits of your labor. Enter Shock Therapy™. Mental focus, training intensity, strength gains and mind-blowing pumps. In one single product, Shock Therapy™ addresses all of your training needs, inside and out. Your trips to the gym will never be the same. The Research and Development department at Universal Nutrition has pulled out all the stops in formulating a product using the most cutting edge, complementary ingredients designed specifically to maximize your training potential. First up is the N.O. Super Pump Complex, a proprietary blend of Arginine AKG, Citrulline Malate and Carnosine. This blend was designed to maximize nitric oxide (N.O.) release. Nitric oxide is a free form gas that is produced in the body and is used to communicate between cells. It's a well-known fact that nitric oxideincreases blood flow. This makes it of great importance to athletes, as increased blood flow will serve to deliver more nutrients to muscles, thus helping muscles become larger when subjected to training. During an intense workout one of the main factors limiting your muscular power and endurance is oxygen and availability of oxygen-rich nutrients. The N.O. Super Pump Complex can help you pump clean oxygen and energy-producing nutrients into muscle cells at a faster rate, thus allowing your muscles to sustain a greater workload. The N.O. Super Pump Complex can give you incredible muscular pumps and greatly enhance your vascularityVasodilation-for that hard and shredded look. For performance enhancement, use 30 minutes pre-workout. Depending on factors such as bodyweight, experience and tolerance to stimulants, use 1-2 scoops per training session. Athletes weighting more than 200 lb (Approx. 90 kg) may require 1.5 to 2 total scoops. Always start with a single scoop (or less) serving in order to assess individual tolerance. Do not exceed 2 scoops in a single 24-hour period. Allow for 6-8 hours of sleep after using.